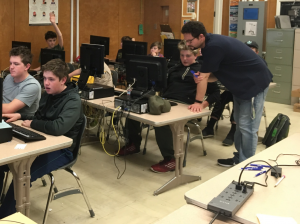 In a first-ever Reno area opportunity, a Coding for Kids camp was held for Boy Scouts on January 11th-12th, 2018. This gave the Scouts the opportunity to earn the coveted Drafting and Programming merit badges. The camp was hosted by the Boy Scouts of the Sierra Nevada Council and powered by NCLab. The Scouts traveled from all over the Nevada Area Council to participate in the camp “3D Modeling: A Drone Modeling, Building, and Coding Camp”. They were challenged to program, print, and fly their own 3D model drone. This class was so exciting for the Scouts that the first camp session sold out the first day. A second camp session was quickly added, and it sold out as well. As a beginner, learning to code a program, or an application, can be a little overwhelming. Through the fun and progressively challenging maze puzzles, Karel showed the Scouts how to write clean, effective code. They also worked with nested loops, conditional statements, and custom code. Once the Scouts understood these basic coding concepts they then went on to create their own maze puzzles. Next, they began to share their maze puzzles with each other, and took the Coding for Kids camp to a whole new level. 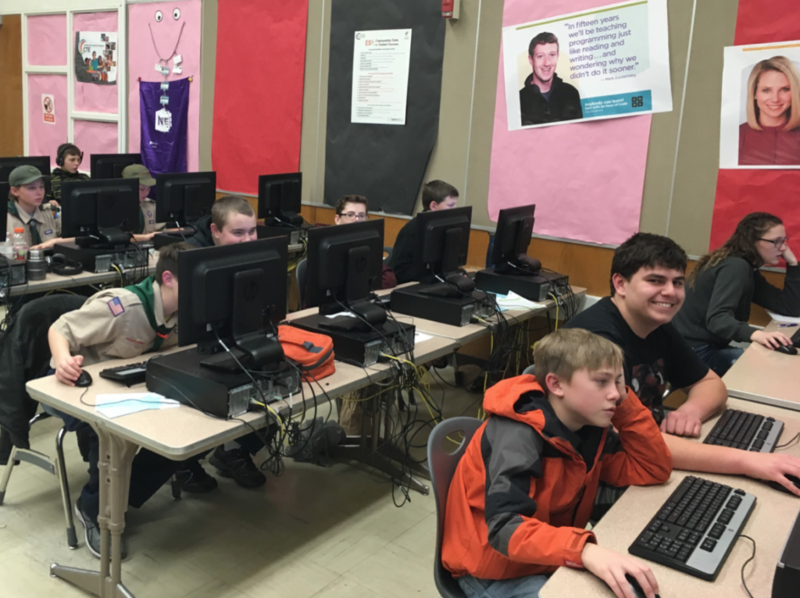 The exchange of maze ideas fostered amazing partnerships as the Scouts began teaching one another coding concepts. Bring Out the 3D Printers! The Scouts’ eyes could not have gotten any bigger when they were told they would begin 3D printing. With the concepts from Karel the Robot mastered, the Scouts began creating their drones. The process of building the drones was set up in several stages. The frame was designed and printed first. After that, other pre-assembled parts were attached. Finally, the whole unit was assembled by hand. This step by step process taught the Scouts visual-spatial reasoning and design in a 3D environment. To the astonishment of the teachers, very few of the Scouts had trouble understanding these complex coding concepts. Some even finished in record time and went on to create their own 3D printed objects from scratch. One Scout programmed and printed his own iPhone case while another designed his own miniature white horse. The camp wrapped up with each Scout giving a presentation. First, they had to demonstrate their drone and its functionality to everyone. Once it successfully landed, each Scout was asked to tell everyone in the camp what they learned. The NCLab Camp teacher at took this presentation a step further. He asked each Scout to explain how they would use the coding skills they learned in their future careers or studies. To complete the Coding for Kids camp, each Scout was presented with their Certificate of Completion. They would be awarded their merit badges at the next Sierra Nevada Council ceremony. Each Scout was given the opportunity to continue their projects and ideas. The camp came with a full year subscription to the NCLab 3D Modeling and Karel the Robot Coding Courses for each Scout. These courses are designed to boost the skills of programmers of all ages and experience levels. Fun and engaging, these puzzles help people understand coding languages such as C++, Java, and Python. All of these languages are used to innovate solutions across a wide variety of industries. From data science to manufacturing and web design, the courses at NCLAB can take almost any career to new heights or open new doors. Sign up now and get your free trial today! Programming Made Easy for Everyone!